by Sister Carol Ann O'Marie, Sister Carol Anne O'marie | Mystery & Thrillers | This book has not been rated. Just one bite of that irresistible Christmas cookie and Christina Kelly, Channel 5's leading investigative reporter, was on the air--dead. The odor of bitter almond told Sister May Helen the cause of the death: cyanide. Somewhere in the studio was the wily killer; it was a person everyone knew. Had Christina's investigations led her to her dead end? Or was the fatal cookie meant for someone else: the notorious womanizer; the hard-drinking floor manager with something to hide; or perhaps Wicked Wendy, who certainly fit her nickname? Or was the intended victim the intrepid nun herself? 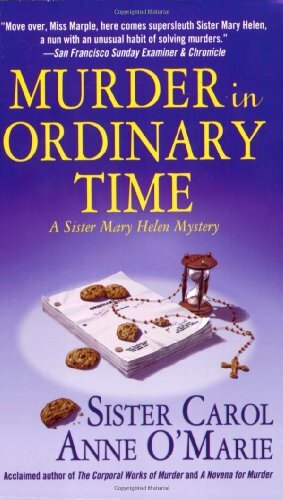 Heaven help her as Sister Mary Helen charges in where angels fear to tread to trap a killer before he strikes again. This one was good, but it wasn't as good as the last one I read in this series. On its way to a sweeps winner. Enjoy the book, drink some tea and have a relaxing time. Arrived today, as part of the Crime and Tea Sweepstake. I'm guessing it took the long way around the world to get here... Talk about traveling books...!!! Thank you very much, I am looking forward to reading this. I will journal again when I have read it and it is ready for release.